Roof Panel Layout is a powerful solution for prefabricated roof panels in Revit®. It enables easy roof panel planning and splitting into segments for prefabrication which can then be used in the roof framing process. Roof Panel Layout automatically generates panel layout planning for any architectural roof. 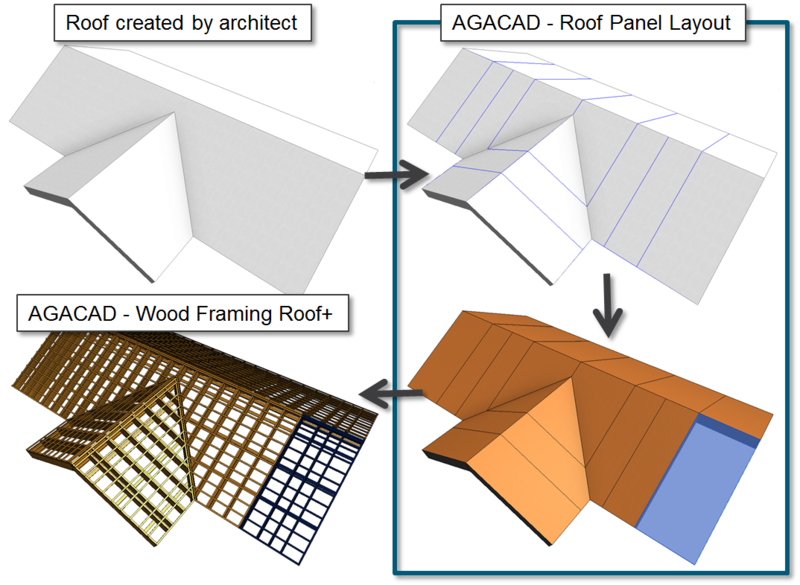 It uses predefined rules to draw symbolic lines indicating the future panels, and then creates real Revit® roof panels. These roof panels can later be framed using WF Roof Panel Frame (previous name Roof+) or MF Roof Panel Frame (previous name Roof+) Roof Panel Frame (previous name Roof+). Prefabricated roof framing can include rafters, battens, valley joists, roof boards, etc. You can also get the same features for Revit® floors with our new Floor Panel Layout solution. Easy roof panelling based on architectural roof geometry. Roof Panel Layout creates prefabricated roof panels based on user-specified rules. Automatically divides an architectural roof into coarse partitions – regions –, identifying and using roof ridge ends and valley rafter bottom ends as well as windows and generic or system openings. Divides a selected roof side or the whole roof into panels based on a predefined spacing and layout method. Creates individual roof segments according to the panel layout. Updates panels for changes to the architectural roof. Makes it simple to control, align, modify or additionally split panels. Existing roof panels can be framed using Wood Framing Roof+ or Metal Framing Roof+. Incredibly fast. Roof Panel Layout enables you to automatically create individual roof panels for any architectural roof shape. Saves hundreds of hours per project. Without this solution Revit® users would need to draw individual panels manually, one by one, and revise them for every change in roof slopes and shapes. Effortless updates. If there are changes in a roof, the user just needs to select “Update Panel Layout” for any chosen roof segment or for the whole roof.